In any country, if you can present Lean as the continuation of the work of local pioneers, it is easier to implement than as a wholly alien concept. Lean’s debt to Ford, Taylor, Gilbreth, the TWI program, and others is acknowledged in Japan, which makes the connection easy to make in the US. In Russia, it was more of a challenge. At OrgProm in 2008, Mikel Wader first told me about Gastev, who was by then so obscure that his books had not been reprinted in 40 years and it took months for OrgProm’s Julia Klimova to locate copies for me. A quick look at Gastev’s works then convinced me that he was indeed someone Russians could look up to as a precursor to Lean. Alexey Kapitonovitch Gastev (1882-1939) was the father of industrial engineering in Russia, creator of the Central Institute of Labor in Moscow in 1920, author of How Work Must be Done (Как надо работать) and Worker Training (Трудовые установки). Through an example, Figure 1 illustrates his thinking. His career was cut short when the government shot him as a “counter-revolutionary” in 1939. PROJECT OF THE YEAR: CUP, AK Gastev. Gasteva Cup – a public initiative, Interregional Public Movement “Lin-Forum. Professionals lean manufacturing. “It lies in the organization and conduct of national competition efficiency of production systems among the leading companies. Companies may be nominated for the award and the Cup as Gasteva program effectiveness and individual projects. Results evaluates expert group, consisting of the most respected and experienced expert consultants on operational efficiency and top managers of successful companies. The award ceremony will be held Gasteva Cup on November 15-18 at the VI Forum “Development of production systems” (up to 2011 – Russian Lin forum “Lean Russia”). Professionals know that their productivity drops when they take on too many concurrent projects. An engineer whose attention is split across 15 projects doesn’t contribute effectively to any. But it happens because supervisors keep piling on assignments without regard to this phenomenon. Over the years, cures have been proposed under different names, all aiming to cap work in process. 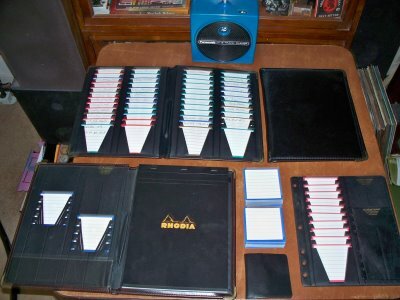 About 1982, a colleague showed me the system he used to manage what he was working on. It was called the Scancard System, and it used the hardware in Figure 1. The cards were square, with 3 1/4-in sides and borders of different colors. They came with letter-size card pocket plastic boards that you could insert into 3-ring binders, keep on your desk or pin to a wall. He used it with one column for his backlog of things to do, one column for work in process, and one column for completed items. It was a paper-based system but, at the time, so was almost everything we did. It gave you visibility, it capped the number of items you were working on at one time, and moving cards from one column to the next was an effective metaphor for the flow of your work. The ads showed smartly dressed managers using their scancard systems in meetings. I went for it and used it for years, until I had a project with a company that used another system and switched to fit in. I put quotes around the name because I find it to be little more than a feat of vocabulary engineering, leveraging the buzz around a feature of Toyota’s production control system to repackage ideas that have little to do with it, are very simple and have been around for a long time. A software developer visiting a factory may see a similarity with Toyota’s Kanbans, but it escapes me. Of course, if, as in Figure 2, it is on a white board, you can’t carry it with you to a meeting or share it in your network. The Personal Kanban website advertizes an iPhone app called iKan, that I can’t find on Apple’s App Store. 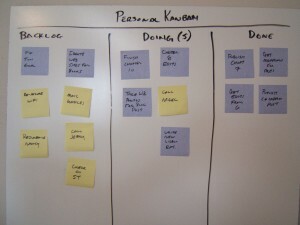 On the other hand, Leankit Kanban offers a web-based application with an iPhone version that looks very much like a team to-do list management system. It looks most useful if your work can be perceived as a collection of independent activities, which happens if each Post-It is for a whole project or for a prospect in a sales cycle. But it would not fit if each Post-It were for a task within a project, with precedence constraints or iterations between tasks. Another limitation of such a status board is that is only shows current status, as compared, for example, with the Ybry chart of Figure 3, which shows the complete history of each project by using a line for each project rather than a card. 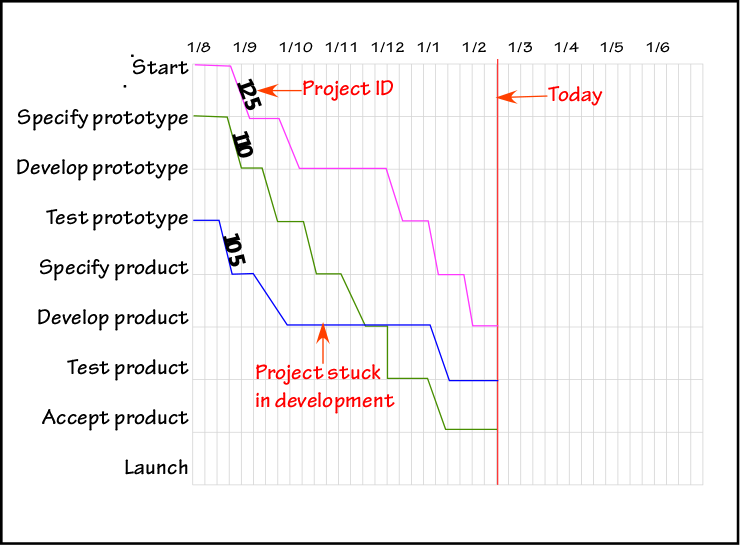 Like the status board, it assumes that all project go through the same sequence of phases. Ybry charts were invented by Charles Ybry in 1846 for railroad scheduling, and are still used for that purpose. See Edward Tufte’s Envisioning Information, pp. 107-110. The work-combination charts used in Lean operator job design are a variation on this method, as explained in Working with Machines, pp. 133-154. In Kaizen, Masaaki Imai describes Japanese executives returning in the 1970s to American plants they had visited thirty years before and being struck by the absence of change: they saw the same production lines with the same equipment operated the same way. This started me looking for photographic evidence. Overall, pickings were slim, but I did find the above pictures of the same coke oven at the Ford River Rouge plant shot in 1946 and 1976. In a plant without Kaizen, operators and supervisors are fully occupied with routine daily tasks: production for the operators, expediting parts, enforcing discipline, and record keeping for supervisors. Only middle managers and executives spend a fraction of their time on projects involving capacity changes, new production lines or new technology. Nobody works on incremental improvements to the way the work is done today. 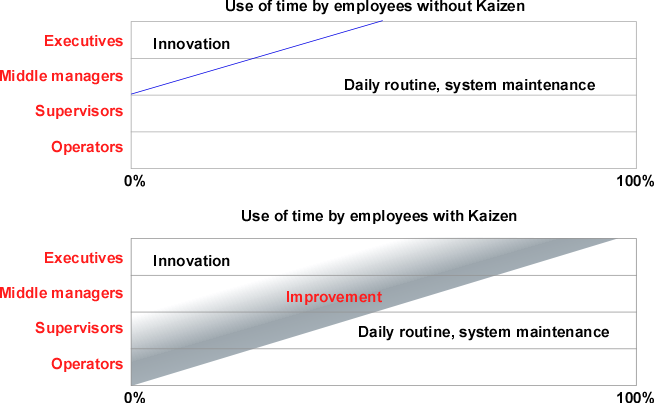 By contrast, Kaizen involves employees at all levels in such improvement activities to different degrees. Between improvement and daily routine, the boundary is sharp; between improvement and innovation, fuzzy. Over time, the cumulative effect of incremental improvement is radical change by itself. In addition, the skills acquired and the lessons learned from incremental improvements are incorporated into new line or plant design projects. In some Japanese auto parts plants, I remember seeing automatic lines side-by-side, where one used old machines that had been gradually retrofitted with devices that reduced the need for human intervention, while the other one had been built from scratch with new machines to be automatic. The Kaizen work done to implement the former was essential to the success of the latter. A speaker I once heard on manufacturing metrics started with a quote from football coach Vince Lombardi: “If you’re not keeping score, you’re only practicing.” In a sport, your score or your rank is, by definition, the correct measure of success, and we assume too easily that this kind of thinking crosses over to every human endeavor, from national economies to plant performance or education. In this process, we begin using highly aggregated metrics as if they were physical measurements like mass or speed, and avert our eyes from how these sausages are made. GDP. Gross Domestic Product (GDP), for example, is in the news every day. If you pollute and spend money to clean up your toxic waste, you contribute more to the GDP than if you produce cleanly. Because of this kind of absurdity, GDP as a metric has been criticized by many economists, including Joseph Stiglitz. In 2009, he even convinced French president Nicolas Sarkozy to seek alternatives. Yet, two years later, the same president is pushing to include in the country’s constitution a “Golden Rule” that caps budget deficits at a percentage of the same flawed GDP! In other words, it makes no sense but you should pretend it does. This is what Peter Drucker called Contributed Value. Value added/Employee is not a perfect metric, but at least it does not provide a perverse incentive to outsource, and the US census bureau publishes statistics on value-added and employment by industry, that are helpful for benchmarking. A good metric is immediately understandable. No training or even explanation is required to figure out what it means, and the number directly maps to reality, free of any manipulation. One type of common manipulation is to assume that one particular ratio cannot possibly be over 85%, and redefine 85% for this ratio as “100% performance.” While this makes performance look better, it also makes the number misleading and difficult to interpret. People see how they can affect the outcome. With a good metric, it is also easy to understand what kind of actions can affect the value of the measurement. A shop floor metric, for example, should not a be a function of the price of oil in the world market, because there is nothing the operators can do to affect it. Their actions, on the other hand, can affect the number of labor-hours required per unit, or the rework rate. A better value for the metric always means better business performance for the company. One of the most difficult characteristics to guarantee is that a better value of a metric always translates to better business performance for the company. Equipment efficiency measures are notorious for failing in this area because maximizing them often leads to overproduction and WIP accumulation. All metrics should have the appropriate sensitivity. If daily fluctuations are not what is of interest, then they need to be filtered out. A common method for doing this is to plot 5-day moving averages instead of individual values — that is, the point plotted today is the average of the values observed in the last five days. Daily fluctuations are smoothed away, but weekly trends stand out. Peter Drucker sold corporate America on the idea that you can’t manage what you can’t measure, and this has led many managers to believe that employees would do whatever it takes to maximize their scores. Given flawed metrics, it if fortunate for the companies that these managers were wrong. If they had been right, all the companies that measure productivity in terms of Sales/Employee would actually have outsourced all production. They didn’t, because metrics are only one of many factors influencing behavior. Most employees, at all level, will not maximize their metrics through actions they feel violate common sense or are inconsistent with their personal ethics. We have all seen the absurd situation in the featured picture above of a line of customers waiting for taxis while a line of taxis next to them is waiting for customers, with a barrier separating them. This particular instance is from The Hopeful Traveler blog. The cabs are from London, but the same scene could have been shot in many other major world cities. I am sure we have all encountered similar situations in other circumstances, which may or may not be easy to resolve. One particular case where it should be easy is the restaurant buffet. 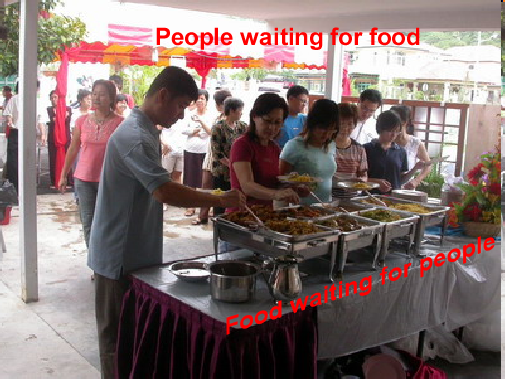 Figure 1 shows a typical scene in buffet restaurants, with a line of people waiting to get food all on the one side of the table, while food is waiting and accessible on the opposite side. I think the fundamental mistake is the assumption that a buffet is like an assembly line, providing sequential access to dishes. This means that you cannot get to the Alo Gobi until the person in front of you is done with the Tandoori. The ideal buffet would instead provide random access, meaning that each customer would have immediate access to all dishes at all times. 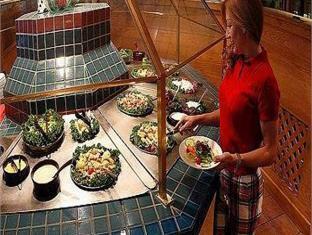 While it may not be feasible, you can get much closer to it than with the linear buffet. 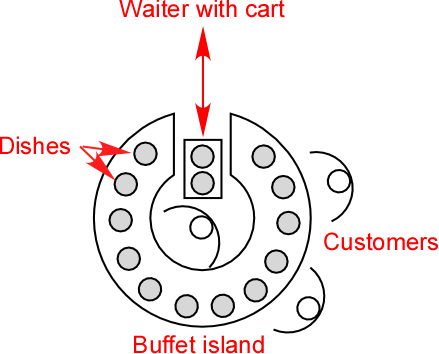 The following picture shows an alternative organization of a buffet in circular islands that is non-sequential. One problem with the circular buffet island, however, is its lack of modularity. 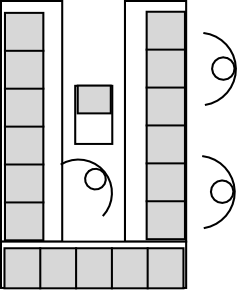 You can add or remove whole islands but you cannot expand or shrink an island, which you can if you use straight tables arranged in a U-shape, as in Figure 4. This buffet island may superficially look like a manufacturing cell, but it is radically different. Its purpose is random access to food as opposed to sequential processing of work pieces, and the materials do not flow around the cell but from the inside out. Such are the thoughts going through my mind while munching on the Naan at Darbar.